Instigated by technological and political change, Europe's rural areas have undergone profound and all-pervasive restructuring processes. Although the impact of these processes has often been depicted negatively, this is not always the case. Bringing together a range of comparative case studies from France, Finland, Germany, Greece, Ireland, Spain, Sweden, Portugal, the UK and other countries, this book provides a comprehensive and balanced picture of rural change over the past five decades. It explores which aspects of the European countryside have benefited and which have suffered as a consequence of the often contradictory forces of restructuring. The book looks into economic aspects as well as into the social impact of rural change. The final part examines regional issues and illustrates how different rural areas have responded to the transformative pressures. 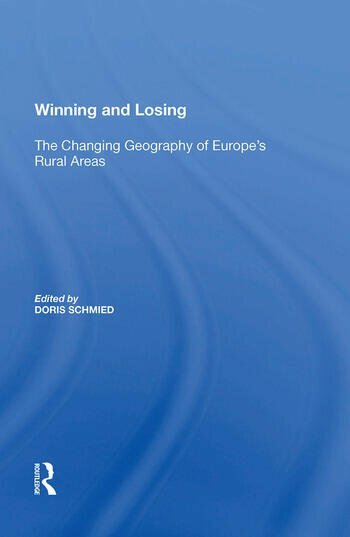 Contents: Introduction: Winning and losing in Europe's rural areas, Doris Schmied. The Changing Rural Economy: Employment restructuring in rural areas, Anne Green; Agriculture on the verge of the 21st century: the challenge of coming to terms with the environment, Maryvonne Bodiguel; Global integration and the industrialization of the countryside, Christos Kalantaridis; Sustainable rural tourism and rural change, Derek Hall; Rural areas in the digital economy, Jeremy Millard; Supply of goods and services in sparsely populated regions: the example of Sweden's glesbygd, Günter Löffler. The Changing Rural Society: Incomers and locals in the European countryside, Doris Schmied; The situation of young people in rural areas, Walter Bien, Lothar Lappe and Richard Rathgeber; Older people in rural Europe: a comparative analysis, Thomas Scharf, G. Clare Wenger, Frans Thissen and Vanessa Burholt; Structural funds and gender mainstreaming: counting heads or changing structures?, Gunnel Forsberg; Tackling social exclusion: an evaluation of local exchange and trading schemes (LETS), Colin C. Williams. The Changing Rural Areas: A booming country - a booming countryside? The Celtic Tiger phenomenon and the consequences for rural areas, Mary Cawley; Mountainous areas - forever losing? The examples of Oberallgäu (Germany) and Sierra de Francia (Spain), Alois Müller; Spatial restructuring of rural Finland, Markku Tykkyläinen; Social capital and rural development: from win-lose to win-win with the LEADER initiative, Gilda Farrell and Samuel Thirion; Index.